Dr. K Sridhar is a well renowned and experienced Endocrinologist based in KR Puram, Bangalore. He has had an experience of 17 years in the field of Endocrinology. He has completed his MBBS and Post Graduate course in Diabetology, Fellow of Academy of General Education (FAGE) and CCEBDM. Currently he is based at KR Puram, Bangalore. Dr. K Sridhar has completed his MBBS & Post Graduate course in Diabetology from Manipal & Apollo Hospital in the year 1999. He has completed his Fellow of Academy of General Education (FAGE) from Manipal Academy of Higher Education and CCEBDM from PHFI-IDF RECOGNIZED in the year 2016. 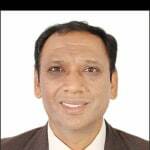 Dr. K Sridhar is a professional member of FPA (Family Physicians Association Bangalore) and Indian Medical Association (IMA). Dr. K Sridhar specializes in adult Diabetes Treatment, Hyperthyroid Treatment, Hypothyroid Treatment, Insulin Treatment, Thyroid Disease in children, Thyroid Disorder Treatment, Type-1 Diabetes Treatment, Thyroplasty and Hypophysectomy. He uses integrated medical approach to give the best results r every disorder. He is one of the first practicing physician in Andhra Pradesh as well as Telangana. He was also awarded the title of Vaidya Ratna by Suman Art Theatres. I found the answers provided by the Dr. K Sridhar to be very helpful. Thanks. I am 54, are taking Vobit 2 table (Twice a day) for last 20 days, now my blood sugar level is about to normal (99 fasting & 148, P.P). I am doing exercise and walking for one hour regularly. Can I reduce the dose or stopped Vobit 2? Hi, please do not stop medication without consulting the doctor. If you need more details please send the reports. After taking glimepiride and metformin medicine I feel more hungry and eat more . i am gaining weight. can you advice whats the problem? Need to see if there are any hormonal imbalance. Glimipride has tendency to increase weight in few patients. Genetic etiology also to be ruled out. In some cases this condition can become life threatening. An addisonian crisis causes a drop in blood pressure, sugar and a spike in potassium levels in the body. This requires immediate medical attention and can be treated with intravenous injections of hydrocortisone, saline solution and sugar. If you wish to discuss about any specific problem, you can consult an endocrinologist..
Graves’ disease is not life-threatening and once symptoms are controlled, the patient’s quality of life improves drastically. If you wish to discuss about any specific problem, you can consult a endocrinologist. Growth Hormone Deficiency - How Best to Treat it? Watch out for the symptoms if your child has delayed developmental milestones and early intervention can help restore growth and function to normal levels. What is good biscuits for sugar person. And what what good food for sugar person. Because my father day to day looks Old. And energy loosing. Please suggest good medicines or food.